The Occidental women’s golf team is a month out from the Southern California Intercollegiate Athletic Conference (SCIAC) championships. After playing a record-breaking fall season, the Tigers came back in January to start their official season. Recently, the team finished third at the California Lutheran Invitational behind the University of Redlands and Whitman College, with Anna Kim (first year) tying for fifth. The team currently sits 26th in the nation after receiving votes from the Women’s Golf Coaches Association of America (WGCA), head coach William Morris said. 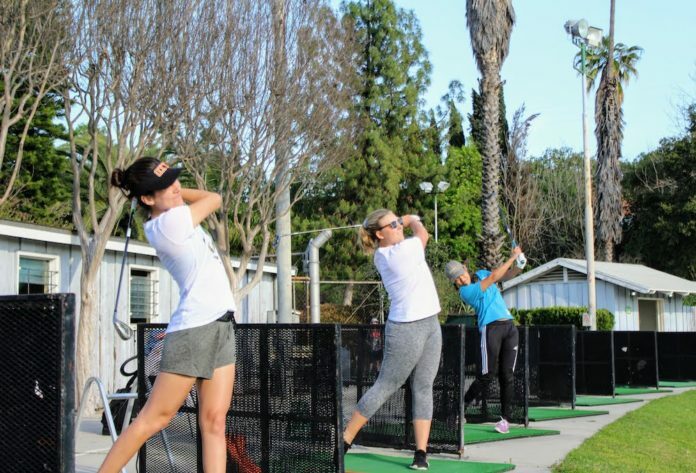 According to the WGCA website, Occidental College received national recognition among all NCAA Division III women’s golf teams. Anna Lundquist (sophomore) and Samantha Rocha (senior) are two members of the six-member team qualifying for this rank, guided by Morris. The team broke the school record of 313 strokes in the fall during a Sept. 17–18 tournament. Although the Tigers were excited about their achievement the first time around, they knew they could improve their skills for the following tournament. According to Lundquist, seeing the team wanting to improve even after performing so well was a standout moment. Although the team consists of six players rather than the average of 8-12, the Tigers are still performing well, according to Lundquist. The misconception that golf is an individual sport is not true, according to Rocha. The camaraderie of the team and individual athletic growth has improved over the past couple seasons, according to Morris. According to Morris, SCIAC is the strongest Division III conference in the nation, and as a result, there is a high expectation and standard for the team. The SCIAC schools represent four out of six teams in the NCAA regional rankings. Claremont-Mudd-Scripps (CMS) won the National Championships a couple of times over the past few years, Morris said. “The team members are truly just very good students who are looking for an experience that’s a good balance between academics and athletics,” Morris said. The team may be small and under-recognized, but the players are able to come together with a common goal and passion for the game, according to Morris. Both Rocha and Lundquist found their love for the sport early in their high school career. As a result, Rocha and Lundquist brought their skill to Occidental as they were drawn to the Division III, school-sport balance of Occidental athletics. The team has done well so far this season, but they are looking to improve in the coming weeks. Chances for improvement include games against other SCIAC schools and a tournament at University of California, Santa Cruz starting March 29. The team is looking forward to playing the bulk of their in-season games over the next five weeks. Their schedule will include a travel tournament and the SCIAC Championships hosted by Occidental College.